The way devotees dress, it is to help us with this conception of identity. It is not that you have to do these external things, but those who do, it should be understood in its proper context. Why do some of us shave our heads? Shaving the head is symbolic. It represents death to the ego because beautiful hair is something that gives people beauty and prestige. 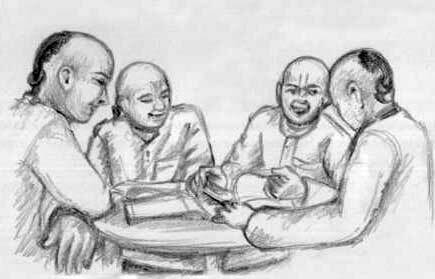 To shave the head in all great religions, whether it is Christian monks or Buddhist monks or Hindu monks or Vaisnava monks, it is an expression of death to the ego so that my real life as a servant of God, I am identifying myself like that. And also we put on this tilaka for the same principle. People are using this body to exploit and enjoy, but tilaka means we do not want any part of that, die to live. Tilaka represents that this body is a temple of God. God is living in this body, the soul is living in this body. This body is a place of worship of God. According to the religious institution, there are so many buildings in the city, some have a star of David, some have a crucifix, some have a trident, some have a cakra, some have a crescent moon and star–what does all that mean. That means this is a place of worshipping God, but why just the building, our body is a place, a temple to worship God. Therefore, this tilaka has very, very great significance—- die to live. Interesting and inspiring explanation. All glories to HH Radhanatha Svami Maharaja. Thank you Radhanath Swami for this eye opening article. Next time onwards while applying the tilak I will try to do it with a higher awareness that the body is a temple to worship God. Very nice. Thanks for sharing the significance of Devotees having shaven head and applying Tilaka. Amazing Realization, thank you for reminding!